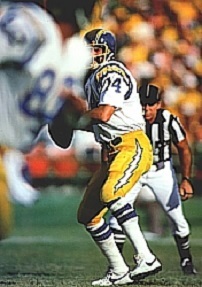 A third-round draft choice by the Chargers in 1973, Fouts gradually took over the starting job as a rookie while an over-the-hill Johnny Unitas faded from the scene in his last season. He struggled for the next two years but benefited from the presence of Bill Walsh as offensive coordinator in 1976. Fouts missed the first 10 games in ’77 due to a lawsuit against the NFL, although he performed well upon his return. Head Coach Tommy Prothro was replaced by the pass-oriented Don Coryell during the 1978 season, and the sturdy drop-back passer’s career benefited greatly. After leading the NFL in yards per attempt in ’78 (7.9), he set a new passing yardage record in 1979 with 4082, led the league in completion percentage (62.6), and was a consensus first-team All-NFL and Pro Bowl selection. Chargers went 11-5 to finish first in the AFC West while leading the NFL in total yards (6410) and passing yards (4531). Won AFC Divisional playoff over Buffalo Bills (20-14). Lost AFC Championship to Oakland Raiders (34-27). With an outstanding group of receivers to throw to in the Air Coryell passing game, Fouts broke his passing yardage record once again with 4802 yards in 1981 while leading the NFL in attempts (609) and completions (360) as well as TD passes (33). He was a Pro Bowl selection for a third straight year, although the Chargers once again came up short in the playoffs. In the strike-shortened ’82 season Fouts led the NFL in passing yards (2883), TD passes (17), and yards per attempt (8.7) and received MVP honors from the PFWA and NEA as well as Offensive Player of the Year recognition from AP. Playing in just 10 games in 1983, Fouts again achieved Pro Bowl recognition. While he never again passed for 4000 yards in the remaining five years of his career, he did throw for over 3000 three more times, led the league in yards per attempt (8.5) and TD percentage (6.3) in 1985, and was twice more selected to the Pro Bowl (for a total of six). At the time of his retirement, he ranked second all-time in NFL career pass attempts (5604), completions (3297), and yards (43,040) and had a passer rating of 80.2. The Chargers retired his #14 and Fouts was inducted into the Pro Football Hall of Fame, Class of 1993.